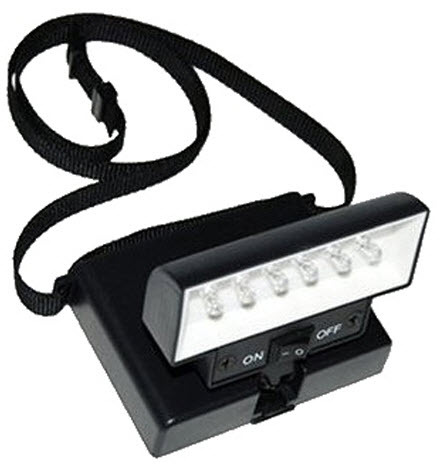 During November 2012, Beam N Read ® Hands Free Lights are being given away by ten top blogs as part of ASF Lightware Solutions' Annual Holiday Gift Giveaway Promotion. Worn around the neck, the light is used for quilting, reading, caregiving, power outages, mobility, and other tasks. Participating blogs include: Insights from SewCalGal, A Life Full of Laughter, Stray Stitches, Caregiver Partnership, Pacific Rim Quilting, Bejeweled Quilts by Barb, Cotton and Chocolate, I Have A Notion, During Quiet Time, and Quilting Gallery. How to Win - Consumers can win an LED light by commenting how their proposed gift recipient would use the hands free light. Each blog is hosting a separate giveaway. The giveaway features the Beam N Read LED 6 Deluxe Hands Free Light with 6 LEDs in a row shining an extra bright and wide light, a $28.95 value. "A prior winner gifted the light to a military hospital serving wounded from Iraq and Afghanistan." "I am surprised how often I use my Beam N Read (BNR) light", said Kelly Jackson, owner of the online quilting supplies shop IHaveANotion.com and avid quilt blogger. "Not only do I use it for my hand sewing, but my husband and children use it too. The BNR came in very handy while at our cabin, finishing raking our leaves one evening and when our power went out it was excellent to have available. Now that I have a BNR....I wouldn't go without one." "It's the Swiss Army Knife of activity lights," said Lynn Wilson, founder of The CareGiver Partnership, a national retailer of home health care products. "The Beam N Read is so useful in a caregiving role as well as many other activities. Our customers love it." "The Beam N Read is the best new hands-free light I have used," said Marilyn Petersen, author, quilt teacher, and owner of Cotton & Chocolate Quilt Company, named a Top 10 Store by Quilt Sampler Magazine. "The light it provides is amazing and the unit is lightweight and easy to use." The Beam N Read LED 6 Deluxe Hands Free Light lights up personal space anywhere - a chair, car, plane, or even in bed. The extra wide light is especially useful for quilting, knitting, and crochet. The extra bright light is also helpful for aging baby boomers and others who benefit from brighter light for reading, caregiving, and other activities. As a reading light it works with eReaders such as the Kindle and Nook, printed books, and newspapers. For mobility, it leaves hands free walking in dim or dark places. The extra long battery life makes it ideal as a mobility and task light during a power outage and for travel and camping. Giveaways will be posted on each blog's start date. Participating blogs with updated links is available on the Beam N Read News and Events page (http://bit.ly/byjLkn) of readinglight.com. Send a short email to info@caregiverpartnership.com describing who you would give a Beam N Read too and why you feel it might benefit them. Thanks for the chance to win one of these special lights. I think my friend, Hazel, would really get some use out of it. My mom would use a Beam N Read for well of course reading. Older eyes seem to need more light to read comfortably and my Mom loves to read. I would love one! (me, I would give it to me!) Quilting and reading are my passions (and love to blend the two, reading about quilting/quilts and novels with quilting themes!) My DH would appreciate not having the big lights on at bedtime too! I would use this myself. My living room is extremely ill lit and I have a hard time seeing not only my crochet patterns, but what I've got on my hook. This would be a great remedy. This is a super gift idea for all of the readers in the family, such as my 94 yr old MIL. I need this light myself since my eyes are getting worse and I need a bright light to continue doing crafts. I have a vision deficit and needs better light to sew. This device would really help me improve my quality of life and the quilts I sew. I would give the light to my husband as he doesn't have good lighting in his den I would also use it myself .